With the close of the spin-merge of HPE Software with Micro Focus, the two organizations have joined forces to become the seventh-largest pure-play software company in the world. Join us on this webinar series – both our over-arching session and the deep dive sessions on each area of focus – to hear how the combined company is built with global scale, a deep portfolio and a strong operational foundation designed to deliver customer-centered innovation for customers, partners and shareholders. As organizations rapidly adapt to the volume and velocity of evolving business requirements, application teams are under greater pressure to deliver at speed and with confidence. The combination of HPE and Micro Focus creates an unprecedented portfolio that gives teams a competitive edge in their DevOps and Agile transformation. Join Raffi Margaliot, SVP and GM, on this webinar as he talks about the new Application Development, Test and Delivery portfolio, its combined synergies, and what to expect from an innovation, delivery and product perspective going forward. Thousands of customers worldwide trust Micro Focus Business Continuity solutions to protect their critical systems, services and data from the core to the edge, across physical, virtual and cloud infrastructures. Don’t miss this opportunity to hear from Roy Ritthaler, VP Product Marketing IT Operations, on this webinar as he unveils Micro Focus’ new Business Continuity portfolio which helps companies to be always protected, always available – without complexity and cost. With the close of the spin-merge of HPE Software with Micro Focus, the two organizations have joined forces to become the seventh-largest pure-play software company in the world. This combination will deliver a number of exciting benefits for customers, and prospective customers, of the company’s Information Management & Governance business. In addition to bringing together technology and domain expertise from the two entities to supplement our information archiving, content management, collaboration, eDiscovery and file analysis product lines, expect to see new solutions and innovation underpinned by our market-leading analytics ecosystem. During this webinar, you will learn how we have taken our 40+ years of experience in the software industry to form an IT Operations Management portfolio that bridges the gap between traditional IT, the new digital enterprise and fast paced new business initiatives. Tune in to hear Tom Goguen, Sr VP & GM IT Operations, Roy Ritthaler, VP of Product Marketing IT Operations, and Joe Fox, Director of Product Marketing IT Operations, discuss how the new ITOM portfolio is accelerating IT at the speed of DevOps faster than ever before. As one of the largest security providers in the world, both HPE and Micro Focus bring together a portfolio of security solutions that bridges IT and protects what matters most—users, apps, data, and the interactions between them. Join us for this webinar to hear John Delk, Chief Product Officer, and Security GM, discuss how the new combined security business combines an open architecture to free up access to data and industry-leading analytics to detect known and unknown threats. Large enterprise businesses must manage hybrid IT environments and adapt to the new digital economy – delivering fast development cycles, modern user experiences and secure user access – all underpinned by the freedom to deploy applications and data across mainframe, distributed, mobile or cloud platforms. Tune in to hear Chris Livesey, Senior Vice President and General Manager of Application Modernization & Connectivity solutions at Micro Focus explain how the team’s customer-centered innovation enables businesses to realize the best possible balance of cost, risk and speed. With a long, solid foundation of innovation, Micro Focus and HPE are bringing 70 years of leadership to a new, focused operating model with deep intellectual capital. Our new company's global scale, software portfolio breadth and depth and strong operational expertise will enable IT to innovate faster, more securely and more intelligently. 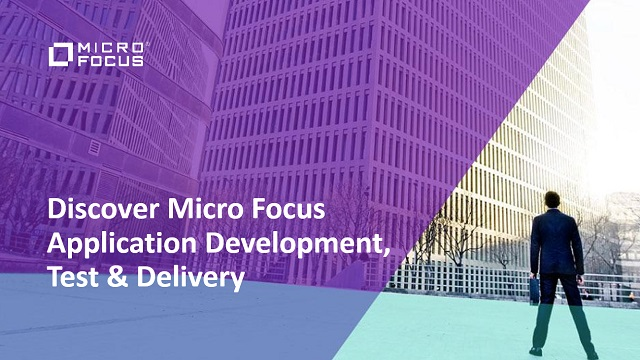 Join us on this webinar to hear Micro Focus executives discuss how the new combined company is built with global scale, a deep portfolio and a strong operational foundation that is designed to deliver customer centered innovation for its customers, partners and shareholders. And after hearing from our executives about the company overall, don’t miss the deep-dive sessions we’ll be giving in the following weeks on each of the separate areas of focus: Analytics and Big Data; Application Development, Test and Delivery; IT Operations Management; Security; Application Modernization and Connectivity; Business Continuity; and Information Management and Governance.